Most anglers must realise that a large chunk of the ability to catch fish lies in having confidence in your tackle and tactics. It doesn't take many hours or even minutes of fishless activity before you begin to wonder whether you are doing something wrong. Of course some anglers are more prone to this syndrome than others and it is most obvious in the tendency to change lures or flies. In the absence of bites, even after only a few casts, susceptible lure/fly fishers will be rooting about in their gear to try and find the thing that works on the day. Sadly, this attitude is often encouraged by angling writers who have vested interests in the tackle trade. If an author is being paid or given handouts by a lure manufacture(s) there will, inevitably, be a tendency to for them to 'push' the sponsor's products, so we finish up with a box full of lures that we never use. Of course, these days, most reputable companies make effective lures so it's likely that the recommended kit will 'work'. So, often there's no harm done except to competing lure sales and if the lure in question seems OK and is tried by anglers fishing in the right times and places it won't be long before reports of catches made on the latest gadget will appear in the press and sales may rocket. 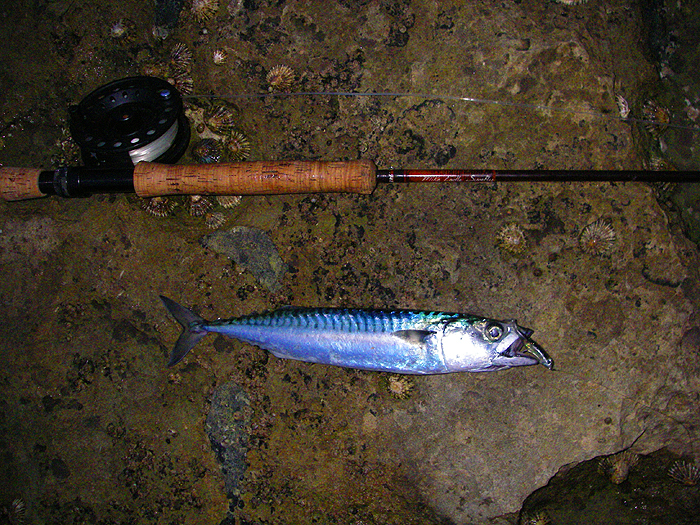 All this was brought to mind on a recent trip to the coast for a spot of 'fly' fishing. My pal Rob and his dad Mike had been the day before and reported an excellent mixed bag with many of the fish landed by Rob using fly tackle. Rob was fishing two flies, a weighted Clousertied a foot behind a 'livebait fly' but he said that takes were even between the two. 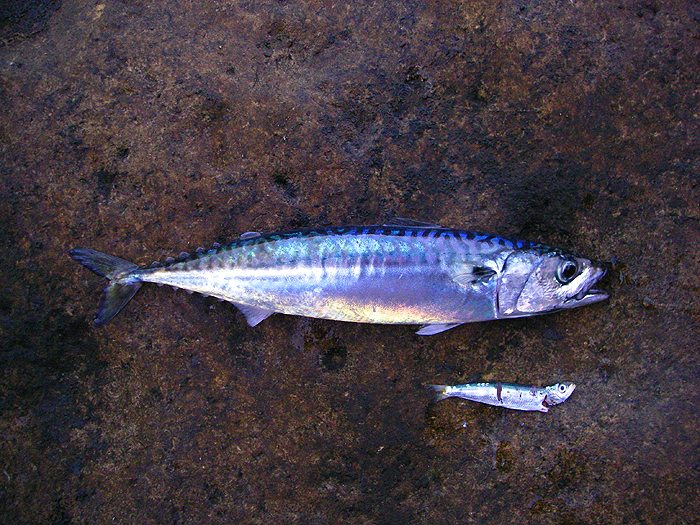 He commented that "All the pollack were very close in, with the scad and mackerel a little further out. I was getting a bite a cast early on and hooked and lost a couple as well." 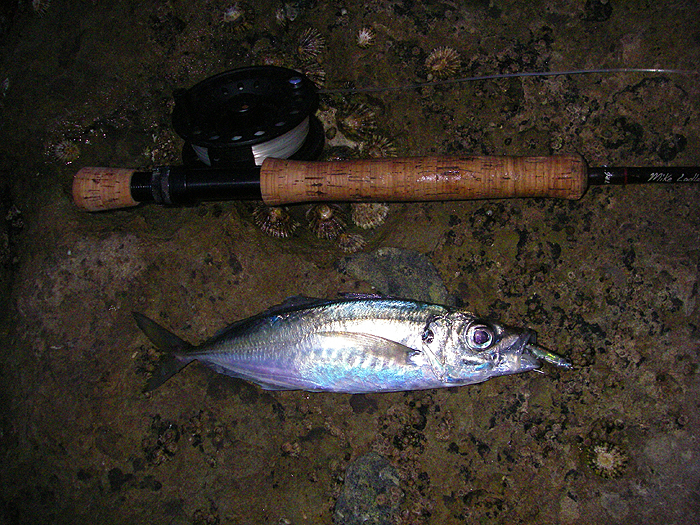 Of course I couldn't resist and the following morning I was down on the shore before dawn armed with my fly rod, floating line, six-pound mono cast and a two-inch, Berkley Gotam Shad as a 'fly'. Now my usual 'fly' for this type of fishing is a small, white plastic, Delta eel but the shads look so much like tiny whitebait that I thought they might be a good bet. Of course there's no better time to try a new lure than when you KNOW that there will be fish biting. Sure enough the little shads, with their irridescent foil inserts and waggy tails, worked pretty well and I had the same three species as Rob caught the previous morning. In fact I didn't catch quite as many as he had - possibly because I was using only a single, unweighted fly (the fish often seem to take better if the fly sinks a bit). I suppose the point is that I now have confidence in the little shads and will probably use them again. Previous experience with similar soft plastics had shown that in order to stop the lures sliding down to the bend on the hook and curling up it was necessary to bind the hook shank with thread and glue the plastic body in position - not quite as fiddly as fly tying. The main reason for catchingfish was simply that I was fishing in relatively calm conditions as the sky lightened. 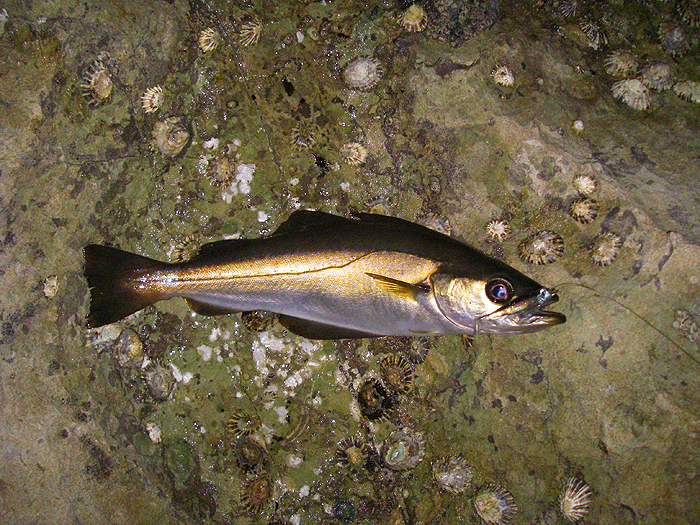 The fish were feeding on sprats which the shads superficially resemble (see my picture taken on a previous session). I tried both the silver versions and the gold ones which look more like tiny pollack fry - both seemed to work equally well. It might be better to try the four inch versions but they are a bit chunky for comfortable fly fishing. If I'd wanted to catch more fish it would probably have paid to use spinning gear but hooking hard fighting, fast running fish on fly gear can be great fun and it certainly boosted my confidence in the lures which are, I think, designed for Light Rock Fishing. I don't think that my shads were any more effective than Rob's flies or my usual Deltas but it's interesting to have a cross-over between the different approaches eh?